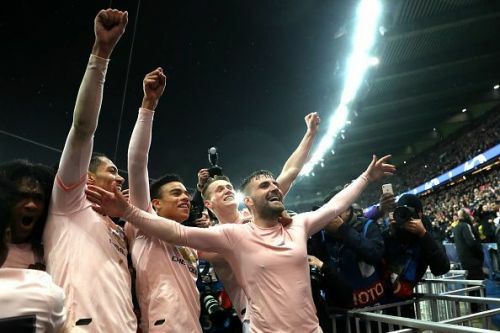 Manchester United beat Paris Saint-Germain 3-1 on Wednesday night in the second leg of their UEFA Champions League Round of 16 encounters. The Red Devils went through on away goals as the aggregate scoreline read 3-3. Marcus Rashford and Romelu Lukaku scored for the visitors, while Juan Bernat scored for the French Champions. The match started with a bang as Lukaku went through on goal from an early mistake from the PSG defense and scored to make it 1-0 after just 2 minutes. The Parisians replied straightaway via a Juan Bernat effort after he was found by Kylian Mbappe 10 minutes later. Manchester United got their second goal of the game around the 30th-minute mark after Gigi Buffon mishandled a shot from distance by Marcus Rashford, and Lukaku was there once again to pounce on the loose ball and made it 2-1 going into second half. The second half started with PSG having much of the ball and Manchester United trying to catch them on the break. The Parisian attacked aggressively but they couldn't find the back of the net and were guilty of missing a couple of decent chances. In the dying moments of the game, Manchester United were awarded a controversial penalty as VAR deemed Presnel Kimpembe's handball a deliberate one. Marcus Rashford stepped up to convert the spot kick to make it 3-1, sending Ole Gunnar Solksjaer's men through into the next round of the Champions League. This win meant that Manchester United completed one of their trademark comebacks and they did it in fantastic fashion. The Premier League giants had 10 first team players sidelined for this game and were also without their best player, Paul Pogba who missed out through suspension. Yet, they managed to win the game and this speaks volume about how Solskjaer is just making these players love football again. For PSG this is another heartbreak as they have been ousted once again from the Champions League in the round of 16. Thomas Tuchel would be absolutely livid with his players after this.